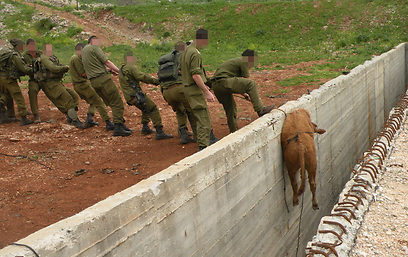 During routine training at the foot of Mount Dov, soldiers from the Combat Engineering Corps and the Givati Brigade came across a calf trapped in a three meters deep cement ditch within the compass of the shooting range. The training was stopped and the soldiers stepped up to rescue the animal. A heavy wait visitor was seen earlier this week within the 769 Brigade’s shooting range area, near Mount Dov, close to the Lebanon border. A mature calf, most likely lost and separated from its herd, entered the shooting range and fell down a three meters deep cement ditch. Soldiers from the Combat Engineering Corps in the middle of a shooting training suddenly notice the animal’s distress while passing by the ditch at noon. “At first, I received reports from my soldiers of a live cow that has survived the fall down the ditch in the shooting range and is now trapped” says Junior Lieutenant Amit Segal from the 769 Brigade. Segal mentions that it was decided to cease the training and the shooting and attempt to assist the animal. “There are several cattle herds nearby and we decided contacting the owners in order for them to check the state of the animal” says Segal. “The calf somehow managed to avoid physical damage from the fall, but run all over the ditch unsuccessfully trying to escape. The soldiers fed it grass until the owners arrived”. Soldiers from the engineering brigade, soldiers from the Rotem battalion of the Givati Brigade and soldiers from the769 Brigade all came to the animal’s rescue. The calf’s owner arrived along with his worker, who went down the ditch and roped the calf. A group of 12 soldiers began tugging the calf “we started tugging but after a short while, one of the ropes tore under the weight and we had to lower the calf back to the ditch and try again with a different rope”. The combined efforts paid off and the calf was rescued unharmed. “Once we had rescued it, it began chasing us. We had to chase it out of the area in order to resume the training and keep it safe”, Segal wraps the successful rescue.